There's a couple. My Tracks and Farm Tracks are good ones. Seems to me at least one of those involve putting a left / right indicator on the hood of your tractor to follow to keep you on line, but from what I've heard if your cell service is good they work reasonably well. We actually were looking into an app for our phone for spraying pasture. 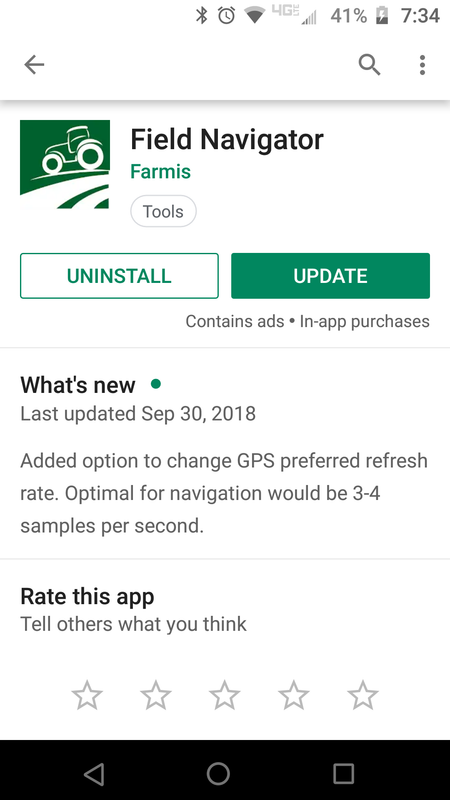 Farm Tracks was one that was recommended but it also stated we should get a GPS antenna along with it. We take our side by side out to spray and it would be nice to ensure we aren’t going over what we’ve already done. Field Navigator . . . . . .easiest thing I've ever used. Free app, all you do is put in your implement width, or spray pattern width, push start and it shades in the area that you have covered. I looked for this in the App Store but didn't see anything called this ?? PriceFarm, someone told me it's not available for Apple, I'm not sure. Android it's available for sure. Must not be I have a iPhone and looked again and couldn't find it.